How To Trap Moles - When it comes to dealing with a mole problem in a yard or garden, there is only really one effective solution, and that is to trap the moles which will then remove the problem. There are many products available that are said to repel these animals, but the reality if you are using these products is there is no guarantee that they are effective, and in some cases they are just as likely to be harmful to pets or other animals as they are to likely to affect the mole. Another issue with moles is that because they only eat live insects, poison isn't really a suitable option either, as their long tunnels means that even an airborne poison wouldn't work on the moles. 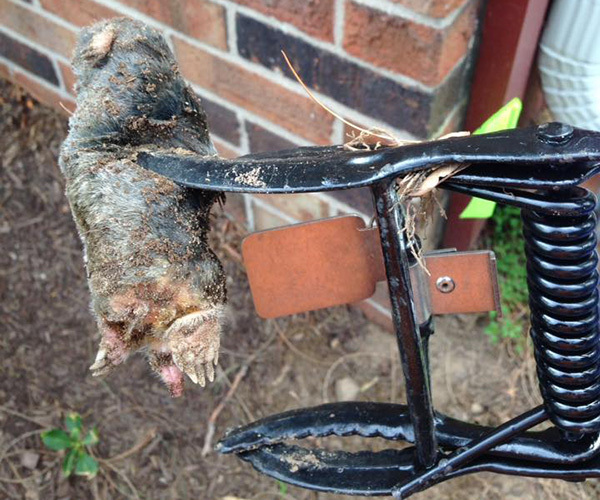 Can You Use Live Traps To Catch Moles? There are many different types of traps available when it comes to catching moles, but cage traps are really problematic as the moles don't leave their tunnels, meaning that the cage traps don't really work as the mechanism won't trigger. Creating a large cavity within a tunnel for the mole also won't work, as it would also involve creating a large crater in which to place the cage, which would cause more damage than the mole's tunnels. Finally, there isn't really a bait that can be used successfully to draw moles out into the open, which means that the most effective solution to deal with the issue is to use lethal traps. 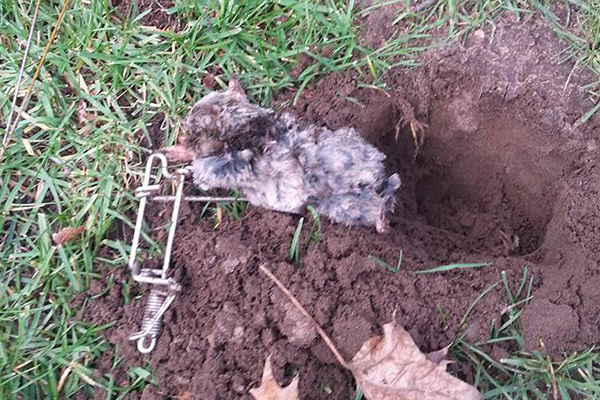 This is the most common type of lethal trap that can be used to catch moles, and is also one of the easiest to use and most efficient, which is why you will find it in most hardware stores or garden centers. The reason it is quite easy to use is that all you need to do is locate a tunnel where the mole has been active recently, and then push the trap from the surface into the tunnel itself. Once you have found the tunnel and the trap is in place, activate the trap and leave it for a few days to do its work. Because there is often more than one mole active in the same network of tunnels, you may need to purchase two or three traps to place in different tunnels to deal with all of the moles. This type of trap is one that does require a little more work in order to get it into the right location, and as with all successful mole traps, it will depend on your ability to find the right tunnel where the tube can be inserted. There is also a little more digging involved with this type of trap, as you will need to dig a hole that is large enough for you to insert the type into the mole's tunnel. Once that is done, you will need to activate the trap and cover the ends with soil to ensure the mole doesn't feel too cautious about the tube. 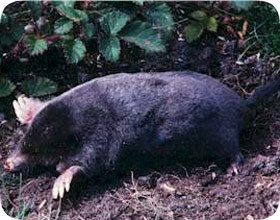 Once the mole goes into the tube itself, the trap is activated and a noose quickly tightens around the mole killing it quickly and effectively. A choker trap is very similar to many other traps that are used by hunters to deal with many different types of animals, and the key to this type of trap is that you place a noose where the mole is likely to crawl through it, and then the noose quickly tightens suffocating the animal. In terms of the placing of the trap, similarly to the tube trap you will need to dig into the mole's tunnel in order to place the trap, but the required hole should be very narrow, just so that you can place the trap in the tunnel. While this type of trap may be inexpensive, it is also the most difficult to use effectively, so if this is the first time you have experienced a mole problem, using a scissor trap is often the best option. While using traps can be an effective way to deal with moles once they are present in your garden, there are preventative steps that you can take to help keep the moles away from the garden to start off with. When you are installing a new lawn in your garden, it can be a wise move to install a wire mesh below the soil and the sod beneath the lawn, as moles can only access the garden from below ground, and the mesh can stop them from getting beneath the lawn to dig their tunnels and create the molehills that are so unsightly. It is also possible to install plants that are said to be unpleasant for moles, and using flowers such as marigolds in the garden, and leeks and onions in the vegetable patch can help prevent moles from coming into your garden. Go back to the main Mole Removal page for more information about mole trapping and information about how to catch a mole in a cage trap.